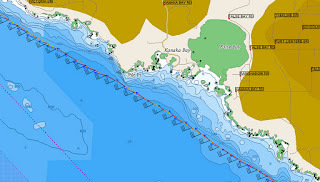 Our last event of the season was Round the County, a two-day event put on by the Orcas Island Yacht Club at the beginning of November each year which circumnavigates San Juan county with a party stop in the middle at Roche Harbor. Shortly before this event we converted Icon back into racing mode by removing all our cruising gear and most of the boat's interior, a job that takes several days. A week prior to the race we held a crew practice as everyone was a little rough as our last formal event was the last leg of the Van Isle 360! The practice went fine but we knew we would be a little out of shape if many sail changes were required. Prior to the race we saw a very unusual weather pattern developing -- a moderate SE blow on Saturday, followed by a strong Westerly on Sunday. This would mean that it would likely be downwind BOTH days which would favor our competition such as Dark Star and Braveheart! 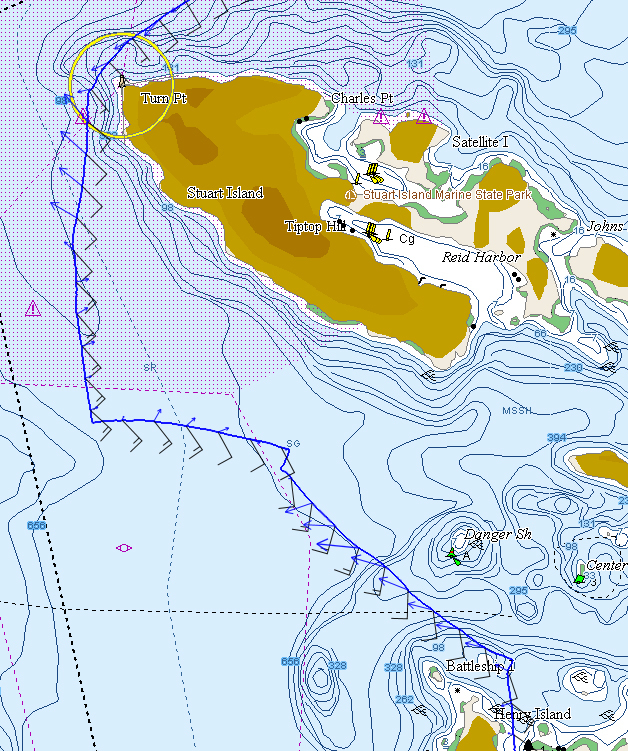 The first day of the race started off Lydia Shoal with a SE wind of 20-25 knots. The race committee totally messed up the earlier starts and left a confused mess before our start. We had a great downwind start and tried to stay right on the rhumb line as much as possible. 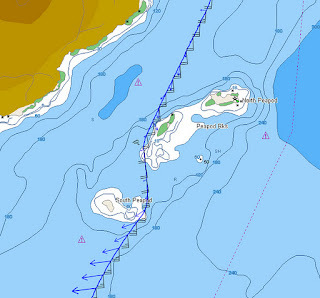 This put is in the middle of PeaPod rocks, but since we have a spinnaker pole we were able to run very deep between them. After rounding Pt Lawrence the wind backed (as expected) and we jibed down the course with the usual gear changes in the lee of Mt Constitution. 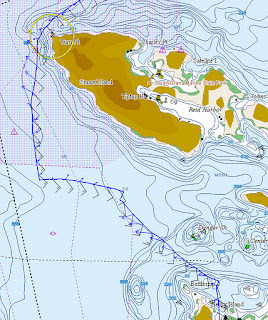 After rounding Patos Island we were somewhat close hauled until rounding Turn Point when we had a short beat to the finish. The only surprise on this leg was the the race committee set the finish line INSIDE the entrance to Roche Harbor -- I still don't know what they were thinking! Sunday started with the predicted westerlies - we knew this would result in us being close hauled which would then free up to a beam reach followed by a downwind run. Again the race committee totally messed up the start and confused the entire fleet. By our start everyone was disorganized, so much so that the Car tried to thread the fleet the wrong way on Port Tack! In the resulting confusion both Icon and Braveheart were OCS (over early) and had to re-start. We had a very close encounter with Dark Star (see the video below) -- unfortunately for Braveheart they didn't know they were also OCS and they had to go back as well! The race turned out pretty much as predicted -- a beat followed by a beam reach which gradually freed up. Many boats set their kites too early and ended up on their side. We tried our A3 for a while but couldn't hold it so we had to go back to our jib top as we ran through the fleet. After crossing over Salmon Bank (a nervous passage given the depth) we finally re-set our A3 and was the first to Davidson Rock closely followed by Braveheart and Dark Star. In the run up Rosario we ended up going back to our Jib Top in 30-35 knots which turned out to be the right combination. As we neared the finish Braveheart managed to slip in front of us even though we corrected over them. In the end six (6) boats including Icon managed to beat our long held elapsed time record of approximately 8 hours -- this time Braveheart set the new record at 6:10:19 which shaved nearly 90 minutes of our latest record set in 2006. In the end we had to settle for 3rd behind Braveheart and Dark Star which had ideal conditions.